Have you found the Loch Ness monster on Google Street View? 6 out 7 Emirates now on Google Maps Street View Flying saucer of Kiev Unusual wedding photo? It looked like a guitar case. & I can see writing on it … like between the thin part & the thick part. The letters are in white. It’s photoshopped(: If you click the View Larger Map & then you look around then you look up again, it’s not there anymore. Tehee. It’s probably just something that passed in front of one of the cameras for a moment. @Everyone Could be part of the bracket the camera was on? Bob the white letters say google, also this picture is creeeepy! This is very intriguing. steering wheel mounted gear shifter or turn signal lever. I see a faint arrow on it even. The question is, how did it reflect onto the plastic covering over the camera? Looks like someone laid a screwdriver or similar tool on the top camera and forgot it. Maybe it’s even from the official Google tool kit. LOL. Maybe google could run a competition. The person to correctly identifies the object after being drawn from a barrel wins. @necronaut Not quite round enough, but quite close. I think you’re right about someone leaving some sort of tool up though. Notice that on the local copy and on the actual streetview viewer, the object is in a slightly different position, above a different building? Very interesting. went to that place on Google Street VIew, and it’s not even actually there. That actually looks like an 3/8″ hex socket. Might even be a 7mm sized one. @everyone If you’ve ever seen the google vehicle that captures these images, you’d know that the camera is in a plexiglass box. There was obviously something on top of the box. As many people have said, it looks like a screwdriver, though, it’s hard to really tell with the glare of the sun right above it. Either it rolled off while they were driving or they noticed and took it off, which is why it won’t appear in more than one or two pictures. Yea it looks like a screw driver was left on the car and just as it fell the picture was snapped. 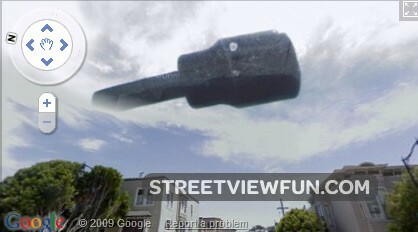 New street view images have replaced this photo of a “UFO”.